In North Carolina, we observe Arbor Day on the first Friday after March 15.Got that? Can you do the math? Let alone remember to put it on your calendar? 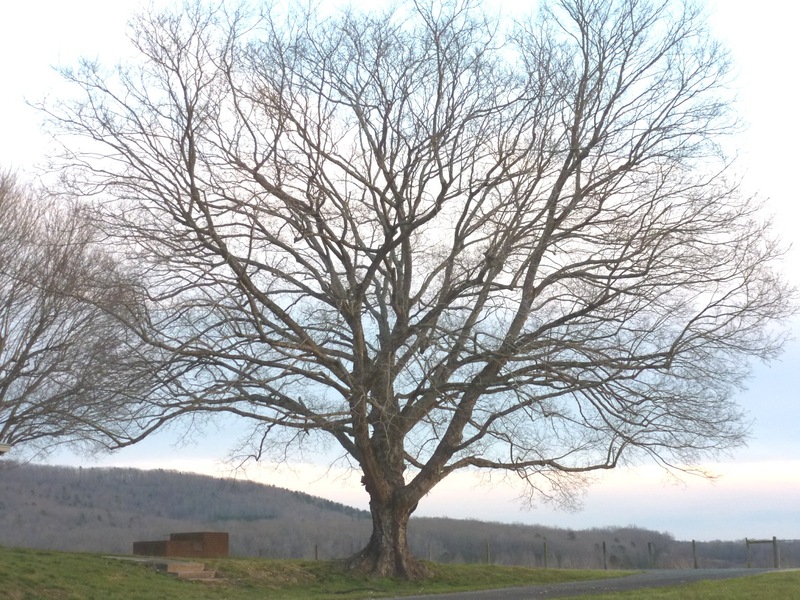 Besides being an unnecessarily complicated date, it’s perilously late in the season to plant a tree in the N.C. Piedmont. The Arbor Day Foundation encourages states to set their own dates, since ideal planting times vary across the nation. Our sister state to the south prudently selected the first Friday in December. Winter planting allows saplings to settle in and establish a strong root system while the tree is dormant, enabling it to better withstand the onslaught of summer’s heat and drought. TreesCharlotte celebrates Arbor Week with multiple events, tree-plantings. In the Uwharrie Mountains, large-scale forestry plantings usually begin in December and wrap up by the end of March. Crews use hoedads to open a slit in the rain-soft ground, then close it again around a tiny seedling. The trees are surrendered to the elements, no coddling with supplemental water or mulch. But when homeowners go to the trouble and expense of planting a larger specimen in their yard, they usually want to do everything possible to help it survive and thrive. According to David Powell, a master arborist with Bartlett Tree Service, that might mean rethinking some of our notions about how to plant and maintain a tree. His recent lecture at Wing Haven rocked my world. I left with a new awareness of potential pitfalls and a rationale for the things I was actually doing right. When selecting a tree, we consider what’s above the ground – species, trunk diameter, branching structure and the like – but when it comes to planting, we have to focus on the roots. They need to spread freely away from the trunk in order to wick up water and stabilize the tree. In that way, bare-root trees have an advantage, but you’re generally limited to very small specimens. It takes the patience of a Zen master to grow a tree from a 12-inch seedling. Large, field-grown trees offer instant gratification, but they’re expensive. They also arrive with their root balls wrapped in burlap or plastic and secured with wire cages that can inhibit adequate root development if hurried landscape crews don’t take time to remove them. Consumers and landscapers alike are moving away from ball and burlap in favor of container-grown trees which are cheaper to grow, transport and install. Unfortunately, their roots develop in a limited space, circling round and round inside a plastic pot. 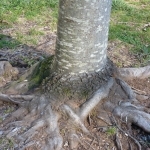 Plopping those trees in a hole unaltered will often result in root girdling, a condition that can stress or kill a tree. 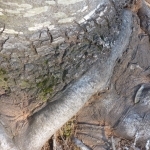 When roots wrap around the trunk, they choke the tree’s ability to take up water and nutrients. They also weaken the trunk, making it susceptible to snapping at the base. Root disturbance at the time of planting is crucial. Powell presented research that compared methods of disentangling knotted roots—combing them by hand, blasting them with a pressure washer, and even dropping them from great heights to break up the root ball. Powell’s take-home message: Don’t pamper the roots! As he says, don’t be afraid to really rough them up. Some sources advise using a sharp knife to cut an X on the bottom and continue up the sides. Spread the cut roots in a wide, shallow hole. Backfill with the soil you just removed—don’t amend it, especially with lightweight materials like peat moss or potting soil. (This will be a tough habit for me to break—I’m partial to breaking up the clay with compost.) Powell recommends thinning the soil with water to create a “slurry” that will spread evenly around the roots. Planting depth is also crucial. 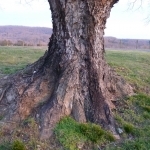 In our red clay, Powell notes, roots generally reach no deeper than a foot, even on the largest oaks. They stay just below the surface and extend well beyond the drip line. You can’t always rely on using the depth of the tree as it appears in the container as a guide. You might need to scrape away some surface dirt to locate the root collar, the place where the trunk flares just above the roots. This should be set above the soil level. After planting, most people mulch around the tree to retain moisture, reduce competition from weeds and protect from lawn mowers or trimmers. However, this practice may be misguided. Mulch piled thick around the trunk encourages the development of girdling roots, undermining the effort to disentangle a pot-bound root ball before planting. Spread a thin layer of mulch to the drip line, but keep it away from the trunk. Ruth Ann Grissom is a writer and conservationist who divides her time between Charlotte and the Uwharries.